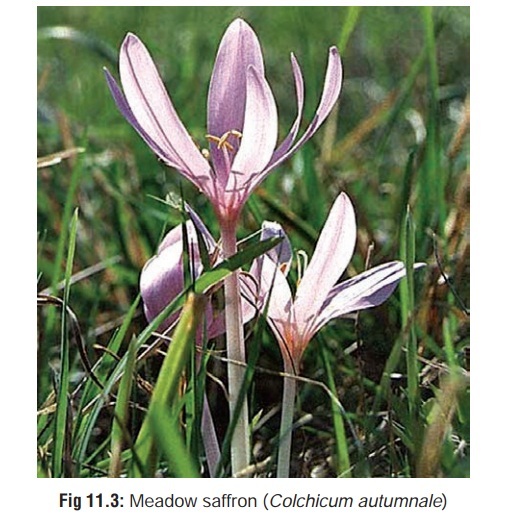 Other Common Names: Meadow saffron; Meadow crocus; Naked lady; Son-before-the-father; Wild saffron. Botanical Name: Colchicum autumnale. Meadow saffron; Meadow crocus; Naked lady; Son-before-the-father; Wild saffron. · It is a perennial plant with whitish or pale purple flowers (Fig 11.3). · The long, broad-lanceolate, dark green leaves are produced in spring, while the flowers bloom in succession from August to October, soon dying down. · The bulb-like fleshy underground stems (corms) are about the size of a small tulip bulb, and lie from 6 to 10 inches deep in the soil. · This plant grows well in England, Wales, and many European countries, but is relatively uncommon in Asia. However, it is encountered in the Himalayan region. The Indian variety usually bears yellowish flowers. ■■ The main active principle colchicine is used in the treat-ment of gout. It acts by reducing the inflammatory response to the deposited urate crystals, and also by diminishing phagocytosis. Deposition of urate is favoured by acid pH. Colchicine counters acid pH environment by inhibiting lactic acid production by leucocytes, thereby interrupting urate deposition and inflammatory response that sustains the acute attack. ■■The fruit capsule of Autumn crocus contains numerous dark brown seeds. The dried capsule is often used as a “rattle” by children. Each seed contains approximately 3.5 mg of colchicine. Ingestion of 2 seeds may be poten-tially lethal. All parts, especially fresh corms and ripe seeds. Colchicine is an antimitotic agent, blocking mitosis in meta-phase and in the G1 phase, preventing DNA synthesis. Poisoning resulting from plant part ingestion is usually less severe than the pure alkaloid (colchicine) poisoning. Common manifestations after plant ingestion include nausea, vomiting, diarrhoea, abdominal pain, tachycardia, and chest pain. Hypotension, bradycardia, seizures, bone marrow suppression, coagulopathy, ECG changes, and death occur rarely. · 1 gram of the fresh corm. · 7 to 60 mg of colchicine (0.5 mg/kg may be fatal). o Fluid and electrolyte balance. o Renal and liver function tests. o Complete blood count (CBC) with differential and platelet count (daily in symptomatic patients). · All patients should be observed for at least 12 hours, because of occasional late onset of manifestations. · Colchicine is believed to undergo enterohepatic recirculation. · Multiple dose activated charcoal may be beneficial because it interrupts enterohepatic recirculation, and should always be considered in patients with potentially serious or lethal ingestions. · Fluid and electrolyte status, especially potassium levels, should be followed closely, with administration of appropriate intra-venous fluids for replacement. · Central nervous symptoms and ascending paralysis with respiratory involvement require aggressive supportive care including mechanical ventilation. · Patients suffering from bone marrow depression should be isolated to protect the patient from infection. · Granulocyte colony-stimulating factor, 300 mg/day, IV, helps in normalising leukocyte count. · Antidote: Specific goat colchicine Fab fragments adminis-tered as an infusion (400 to 500 mg). There are case reports of dramatic recovery from potentially lethal colchicine poisoning. · Haemodialysis and exchange transfusion are not likely to be helpful because of the large apparent volume of distribution of colchicine. · Multiple petechiae and ecchymoses over visceral pleura, pericardium, and peritoneum. · Haemorrhagic oedema and congestion of lungs. · Inflammation of stomach and intestines. · Fatty degeneration of liver. Microscopy may reveal fatty changes and necrosis in the central portions of hepatic lobules with cells demonstrating “colchicine bodies”, i.e. nuclei containing clumps of chromatin material. In a recently reported case, autopsy revealed hepatosplenomegaly (with significant haemorrhagic necrosis around central hepatic veins) and acute tubular necrosis. Hepatocytes showed hydropic or microvesicular fatty change, and portal triads were infiltrated by mononuclei. In addition, left cardiac ventricle hypertrophy and cerebral oedema were observed. · Kidneys may demonstrate evidence of acute tubular necrosis. · Microscopy of bone marrow tissue: hypocellular marrowwith marked depletion of erythropoietic and granulopoietic cells, and moderate depletion of megakaryocytes.